Rather than a strict SUV, the Element is more like a motorized sports gear tote, for “active lifestyle” folks. Though not designed for comfort, or for serious off-roading, it’s a versatile, practical, and roomy compact wagon that incorporates Honda’s expected solid workmanship and thoughtful features. That earns the Element a Recommended rating. Based on Honda’s CR-V, this new youth-oriented compact SUV featured novel interior touches and unique wagon styling. With its center-opening side doors, and no center body pillars, the Element was a bit taller and wider, and up to 200 pounds heavier, than a CR-V. Both models shared a four-cylinder engine, as well as manual and automatic transmissions. The Element also offers the same front-wheel drive or all-wheel drive layout, without low-range gearing. Unlike CR-V, the Element had a combination upper liftgate and drop-down tailgate, rather than a swing-out door with a glass hatch. As in some extended-cab pickups, the Element’s rear-hinged back doors were shorter than the fronts, and could not be opened or closed independently. While the CR-V seats five, the Element carries four occupants on front bucket seats and a split rear bench. Weighing j30 pounds, the back bench’s sections could be swung up to the side or removed to yield more cargo space. AWD models included a tilt/removable glass “skylight” over the cargo bay. Base DX Elements were equipped for owner personalization, and thus came without factory audio. Upscale EX editions included a 270-watt CD audio system, plus alloy wheels, two-tone interior trim, cruise control, power mirrors, and air conditioning (which was optional for DXs). All models had water-resistant cloth upholstery, rubberlike textured floor covering, 16-inch wheels, and four-wheel disc brakes. EXs added ABS and offered front side airbags as an exclusive option. 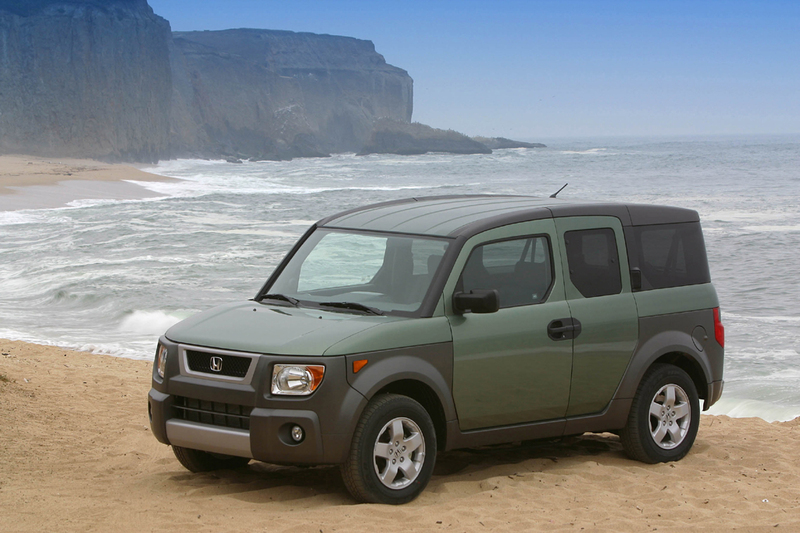 Competitors included the Ford Escape, Honda CR-V, Jeep Liberty, Mazda Tribute, and Subaru Forester, though Honda’s Element differed from each of these in style and personality. Honda’s youth-oriented compact SUV got only minor changes for 2004. EX models gained a passenger-seat armrest and remote keyless entry. Air conditioning was a dealer-installed option for DX models. For 2005, the LX Element matched the upscale EX with standard cruise control and power mirrors. No DX model remained. Side airbags and ABS were standard on the EX. Antilock brakes are standard for 2006. More safety features, a new sporty model, and a touch more power marked 2007 for Honda’s boxlike SUV. For 2007 the 156-hp 4-cylinder engine gains 10 hp. Available were a 5-speed manual transmission, and for ’07, a 5-speed automatic that replaced a 4-speed. Element came in LX, EX, and new-for ’07 SC trim. The SC was not available with AWD. ABS was standard. Front side airbags were standard on all models; they previously were unavailable on the LX. Curtain side airbags were also standard; they previously were unavailable on any Element. LX and EX models also got revised front styling for ’07. 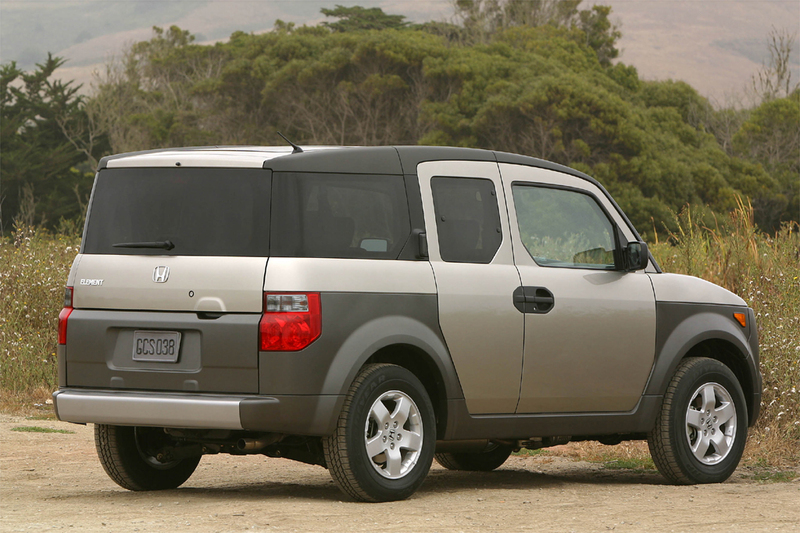 The 2008 Honda Element was basically unchanged. 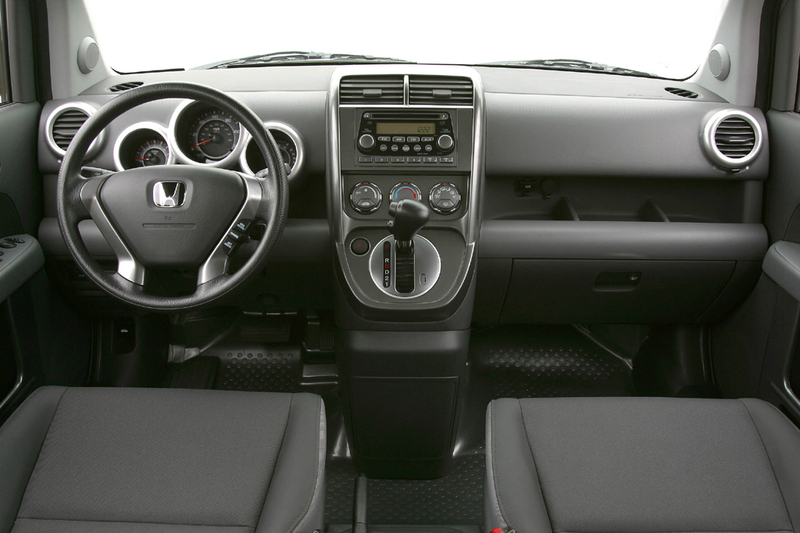 The 2009 Honda Element got freshened styling and some new features. Newly available on Element EX and SC models with automatic transmission were a voice-activated navigation system and rearview camera. The 2010 Honda Element received a new “Dog-Friendly” option package. This package, exclusive to the EX, includes equipment that makes for easier and safer transportation of a canine, such as a cargo-area pet bed, a cargo-area ramp for pet entry and exit, and all-weather floormats. Also for 2010, manual transmission was no longer offered for the Element. 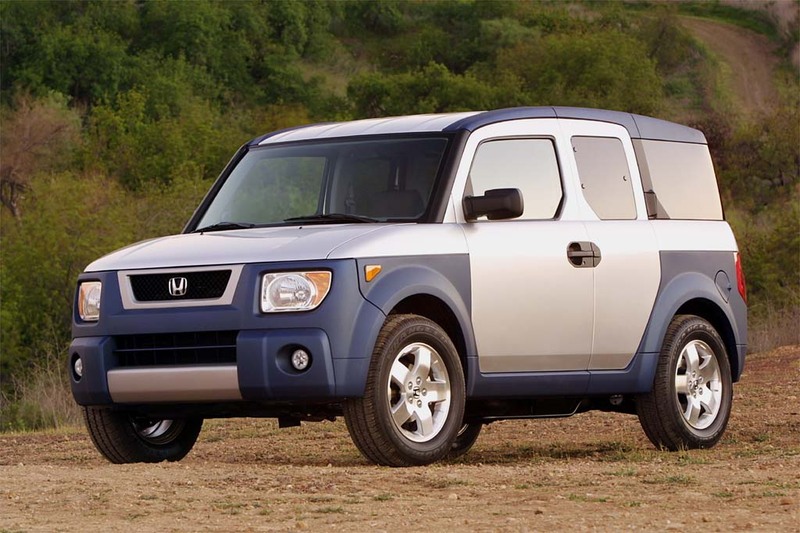 The 2011 Honda Element lineup shrinks, losing the sport-themed SC, for what will be its final model year. All Elements have a 2.4-liter, dual-overhead-cam four-cylinder engine developing from 156-166 horsepower depending on year. Elements could have either front-drive or all-wheel drive. Initially, either a five-speed manual transmission or a four-speed automatic could be installed. For 2007, a 5-speed automatic replaced the 4-speed, and for 2010, the manual transmission was dropped. EPA rating with 2WD is 21/23 mpg for manual transmission and 21/25 mpg for automatic. Performance is adequate, especially with manual shift. A test 2WD LX with manual transmission accelerated to 60 mph in 8.8 seconds. Honda advised that the AWD Element with automatic took 11.4 seconds. Overall, manual-transmission Elements feel decently spry and promise very smooth, low-effort clutch/shifter operation. Automatic-transmission versions do not feel sluggish, but need liberal throttle for brisk takeoffs or to maintain speed up steep grades. An automatic AWD Element averaged 21.2 mpg. Another with manual and 2WD averaged 22 mpg, including gas-eating performance tests. A manual AWD model got 19.2 mpg in mostly city driving. Honda recommends regular-grade fuel. Ride quality depends on where you sit. Rear occupants nestle between the wheels, and therefore suffer unrelieved chop and thump over bumps. Front-seat riders will be more comfortable, but the ride is still stiff–jiggly on patchy pavement and washboard surfaces. Body control is decent over large humps and dips. More nimble than the tall, boxy shape might imply, the Element offers stable, predictable cornering with little tippy feel. However, the slab-sided body is subject to crosswind wander at highway speeds. Front-drive models suffer pronounced torque steer–pulling to the side–in rapid acceleration, and slippery pavement can easily induce wheel spin. To a lesser degree, it’s the same story with AWD, which suffers a delay before the rear wheels engage with a clunk. Routine braking is acceptable, though not everyone appreciates the pedal feel. An ABS-equipped model is the better choice. Tire thrum is evident on coarse pavement, but the boxy design resists intrusive wind rush until 65 mph or so. The engine is gruff and throaty in rapid acceleration, and at higher rpm. The manual-transmission 2WD version turns at a buzzy 3800 rpm, at 75 mph. Element dashboards feature a simple, convenient climate panel and audio unit. The shift lever sprouts from the lower dashboard and falls readily to hand. Hooded gauges can be difficult to see in some lighting conditions, and are partly obscured for tall drivers because the standard tilt steering wheel does not raise very high. Cabin decor stresses sturdy function over flash, with water-resistant upholstery and floor covering. Though it looks utilitarian, the Element is nicely assembled from good-quality materials. Adults get ample leg and head room up front, but hard seat padding isn’t conducive to long-haul comfort. The standard driver-seat height adjustment is welcome, but has limited range and tedious handwheel control. An SUV-tall driving position and short nose give a panoramic feel, though various roof pillars limit visibility to some quarters. Front doors open wide, but are very long, thus troublesome in tight parking spots. A lower step-in height than in most compact SUVs eases all-around entry/exit for rear occupants. Opening both side doors leaves a wide, unobstructed, but fairly short entrance. Head room is only adequate for six-footers, but there’s ample leg room even with front seats set fully aft. The rear bench suffers even skimpier padding, plus too-short cushions and backrests. Rear doors open a full 90 degrees, but are difficult to reach and close from the rear seat. The industrial-look rubber flooring can become slick when wet. With seats suitably arranged, the Element can tote a 10-foot surfboard or sleep two six-footers with the hatch closed. There’s a useful 25 cubic feet of cargo space behind the split rear bench, whose sections stow easily and quickly. Too bad complete removal and reinstallation are difficult, time-consuming chores. The cabin has loads of nooks and crannies for small items. Description: The interlock lever of the ignition switch may unexpectedly deform, which can allow the interlock function of a vehicle with an automatic transmission to be defeated. Removal of the ignition key when the gear selector of a vehicle with an automatic transmission has not been shifted to the park position can allow the vehicle to roll away, increasing the risk of a crash. Dealers will remove the original interlock pin and lever within the ignition switch, and replace them with new, designed components. This service will be performed free of charge. Description: Due to incorrectly-wired harness of trailer hitch kit, trailer brake lamps and turn-signal lamps could operate incorrectly, or fuse could blow causing sudden loss of lamp functions. Description: The outer race of the secondary shaft bearing may be broken during certain driving styles. A broken outer race may cause abnormal noise, the malfunction indicator light to turn on, and allow contact between the transmission idle gear and an electronic sensor housing within the transmission. This could result in a short circuit causing the engine to stall. Additionally, broken pieces of the outer race or ball bearing from the secondary shaft may become lodged in the parking pawl resulting in the vehicle rolling after the driver has placed the gear selector in the park position. Engine stall and unexpected vehicle movement increases the risk of a crash or personal injury to persons within the path of a rolling vehicle. Honda will notify owners and dealers will update the automatic transmission control module software free of charge. Description: Air can enter the VSA modular pump during an initial self-check process that occurs shortly after each time the engine is started. It’s possible for enough air to enter the system to result in a brake pedal that feels soft or lower to the floor. If the owner does not have any brake service or maintenance performed over a period of months or years, the system can continue to accumulate enough air to affect braking performance, increasing the risk of a crash. Honda will notify owners and Honda dealers will repair the VSA modulator by removing any existing air in the brake system then apply sealant and caps to prevent air from entering the brake system free of charge. Description: Due to faulty wiring, trailer turn signals only work when brake lights are illuminated. Description: A suspension component may have been improperly welded and could separate. This could cause the suspension to release the lower portion of the wheel hub, causing a loss of control and damage to the brake system which could lead to a crash. Dealers will inspect and, if necessary, replace affected parts. Description: During assembly process, the cable that connects the shift lever to the transmission was not set correctly at the shift lever bracket. As a result the driver may move the gear shift lever but the transmission may not be placed in the selected gear. This can cause the key to be stuck in the ignition switch, an inability to shift into or out of park, or an inability to shift into reverse, increasing the risk of a crash. Honda has contacted some owners by phone and arranged to, have, or has had, their vehicles repaired free of charge. All other owners will be notified by mail. Dealers will correctly set the shift cable bushing. Rear kennel w/pet bed, stowable ramp, spill-resistant water bowl, electric fan, leash, collar, dog tag, special seat covers and floormats.